Complete balanced nutrition with no artificial colors or flavors and no synthetic vitamins. 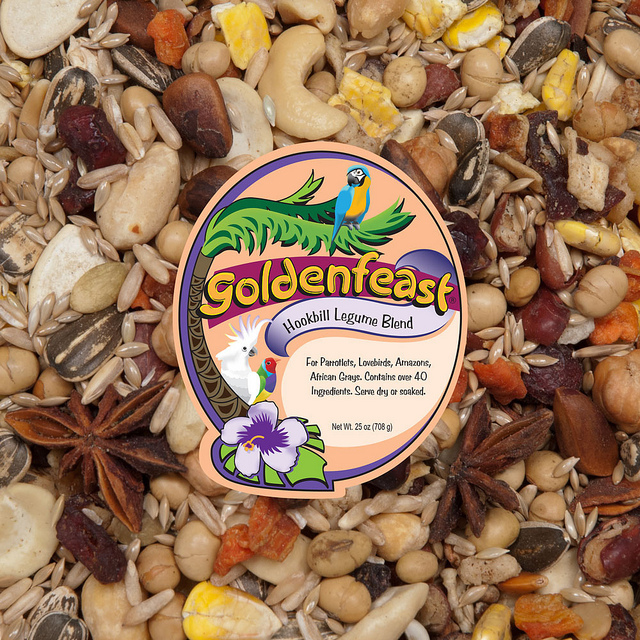 For Parrotlets, Lovebirds, Amazons, African Grays and other exotic birds. Contains almost 50 wholesome ingredients. There is no competitive formula that comes close to the variety and balanced nutrition of Hookbill Legume Blend. Vegetable and fruits are dehydrated unless specified otherwise. Beans are cooked and dehydrated for better nutritional absorption. Serve dry, soaked or cooked. Each package is date coded for guaranteed freshness. 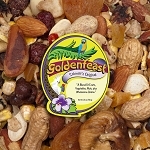 Ingredients: Canary Grass Seed, Sunflower Kernels, roasted whole Soybeans, roasted rolled Corn, Cranberries, roasted Cashews, Carrots, Blueberries, hulled Oats, whole Wheat, whole Pumpkin Seed, large dark gray Sunflower Seed, Safflower Seed, Granola made with rolled Oats, Whole Wheat, Brown Sugar, Canola Oil, natural Coconut, sweet dairy Whey, Oat Flour, roasted Almonds and Honey. Buckwheat, Cherries, Banana Pieces, Pepitas, freeze dried Sweet Cane Molasses, cooked and dehydrated Beans and Peas, raw Brazil Nuts, In-shell Peanuts, Papaya, Pine Nuts, Sweet Potatoes, sterile Hemp Seed, Date pieces, granulated Orange Peel, whole Star Anise Seed, Wildflower Seeds, whole Bee Pollen, Juniper Berries, roasted Chic Peas, Mango, Japanese Millet, freeze dried Sweet Corn, Apples, sweet Red and Green Peppers, Natural Fruit Flavors. 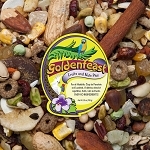 Remove flavor fresh packet from container, add 1cup blend to 2 cups boiling water. Stir, remove from heat and cover. Let stand until cool. Stir again and feed. Refrigerate left over amount for up to 3 days. 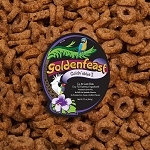 Can be cooked ahead of time and frozen to be served at a later date. Refrigerate after opening to retain freshness. 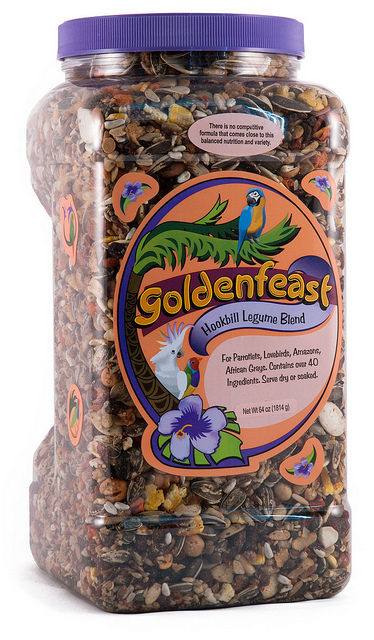 The Goldenfeast Hookbill Legume is a great product. 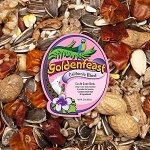 I have used it for nearly 2 years, and my Maluccan Cockatoo refuses all other seed mixes. I live in Croatia, so it it expensive to ship... but well worth it when I see my happy bird enjoy eating. 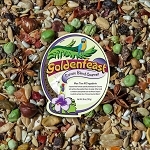 This is a seed mix I'm happy to put in my bird's bowl. All sorts of goodies for her! I have used this product for 3 years. My cockatoo is very fussy about her food, but this one she will always eat! I live in Europe so shipping is expensive ... but worth every penny.